If you’re an artist, deciding to sell your art online could be the best choice you’ll ever make. The art market is booming and with the internet you can put your artwork in front of thousands, even millions of potential art buyers every day. But what’s the best way to sell art online? Should you program your own art website? Well, that’s probably not the best choice for most of us, and I’ll be the first to admit that coding a website is kind of tricky and very time-consuming. Another option is paying for a pre-built website that lets you display your art online without worrying about the code. I actually started a company (you may see it being advertised around EmptyEasel) that offers this exact service—foliotwist artist websites have a built-in admin panel that makes uploading images about as difficult as sending an email. There are also a lot of online galleries which will sell your artwork online for either a monthly fee or sales commission, and display your art alongside thousands or tens of thousands of other artists. Before you plunge into this exciting new art marketplace, however, you might want to consider the number of visitors and potential art buyers that each website gets per month, and to make things easier for you, I’ve put together some traffic statistics comparing five of the best art-selling websites online today. Of course, traffic stats are similar to poll data, which means the numbers and percentages you see in these graphs are just estimates based on participants who allow their internet surfing to be recorded for that purpose. As long as we keep that in mind that they’re not perfect, and compare a few different sources, we should be OK. The red line shows traffic for Imagekind.com, a site that sells prints of your original art, not the actual artwork. If you haven’t heard of them before, you can follow the next link to read more about their methods of selling print-on-demand artwork. OriginalArtOnline.com (shown by the light blue line) is pretty well-designed as online art galleries go, but it’s at the bottom of the pack according to these stats. The two “newcomers” of blue and orange are Sistino.com and ArtistRising.com, which aren’t really newcomers because they’re actually offshoots of Art.com. Switching to Alexa (another web traffic site), you can see that the overall positioning of each website is the same, although there’s more of a gap between Imagekind and BoundlessGallery, and both Sistino and Artist Rising are farther down as well. Also, I want to point out that Alexa’s graph goes all the way through the end of March, which shows a dip in traffic for almost all of these art sites. I’ll be keeping a close eye on Compete in the next few weeks to see if it echoes that as well. 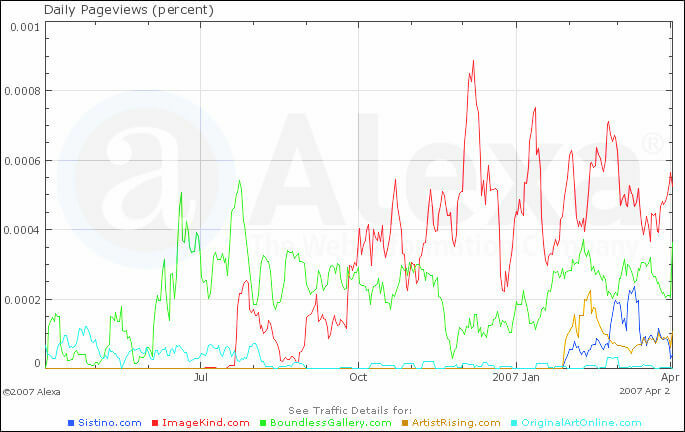 I also took a look at Quantcast.com (a third traffic analyzer), which showed approximately the same information as the other two, although both OriginalArtOnline.com and Artist Rising were even lower in overall ranking. This next graph was posted over at Imagekind’s blog and shows Imagekind’s true traffic history over the past six months, but without any identifying numbers. That upward growth pretty closely matches the graph from Compete.com, which helps to verify all of these statistics a bit more. So what can we assume from this data? Is Imagekind the best place to sell prints of your art due to its higher traffic? Maybe just according to traffic. . . but let’s take into account the social networking aspect of Imagekind, too. Participating artists may spend a lot of time on the site themselves, making it seem as though there’s more “art buyer” traffic than there actually is. Artist Rising might have the same problem with its own artists affecting its traffic numbers, since there’s an artists’ forum incorporated into ArtistRising.com itself. Out of the five, I believe that the Sistino, BoundlessGallery, and OriginalArtOnline traffic statistics should be pretty consistently buyer-based, and therefore good indicators of the number of visitors that would be looking to buy your art. And I know what your next question will be: how many of these potential buyers actually make a purchase during their visit? Well, I honestly wish I could tell you, but I can’t. That information, along with actual traffic stats, is closely guarded by each of these companies. And trust me, I’ve asked. I suppose there’s no reason why all of us participating artists couldn’t get together and compare notes, so if any of you would be interested in that, just let me know. Hmm. . . an online artist’s union, perhaps?? Now that’s something to think about. : ) Until it happens though, I’ll be sure to keep you posted occasionally on these traffic rankings. I learned so much from this post. I can't believe BoundlessGallery shut down. It was such a good site. It would be great to have a peek at the analytics reports for these companies. I know Quantcast and Compete claim their numbers are just estimates but I know they are far from accurate as I manage analytics accounts for MAJOR websites and often compare actual traffic to Quantcast and Compete estimates to gauge their level of accuracy. RedBubble.com looks good as well as Empty Easel. I started Artists.me which is not meant to compete with other art sites but is meant to focus more on the Artist themselves. Also allows artists to sell their work for free using Paypal. Foliotwist looks like a great alternative for Artists that don't want to bother figuring out techy website stuff or WordPress blogs. Again, thanks for the valuable post!